Celebrating One Full Year Free of Obama in SoCal | Stop Obama Now!! of Obama Fundraiser in La Jolla, California Large parts of Southern California have become a ‘no-go zone” for Obama. 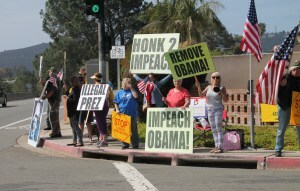 Last year on May 8th, 2014 we held an impeach-Obama-NOW protest of an Obama fundraiser in La Jolla, California. See video below. This was one of many protests for Obama’s impeachment in the area over the last few years. Since then Obama has not returned to San Diego, County, though he used to visit fairly frequently. Such protests do have an impact. The wealthy people hosting such fundraisers do not like to see droves of loud protesters right in front of their home. So, they do not offer to hold more fundraisers.